In Tibet, the Buddhist tradition is ancient, the result being that everyone acknowledges daily recitation of sacred mantras has beneficial effects for the mind and body. 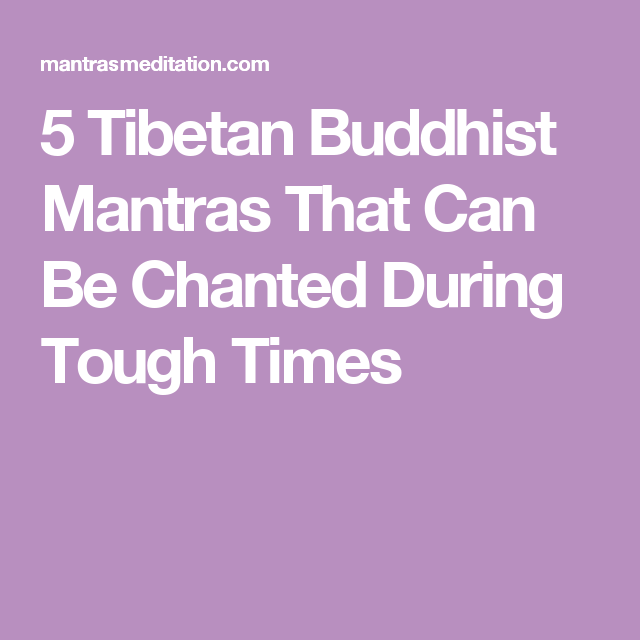 For Tibetan mantras, the sound of the chant is as essential, sometimes more important, than the meanings. In some Tibetan Buddhist lineages, the sounds are said to be manifestations of the true nature of reality. When recited with mindfulness and great focus, these Buddhist mantras can become a powerful tool for meditation. Moreover, reciting mantras is the easiest way of getting started on the road towards opening new horizons for the mind. To start with, it is a very potent method to purify the negative karmic imprints we all bring into the world with us. This soothing mantra is particularly important to devotees of the Dalai Lama (”ocean guru”) because he is said to be an incarnation of Chenrezig (Bodhisattva Avalokiteshvara). It is said that the merits of this mantra, also known as the six-syllable mantra, are countless and cannot be fully described even by the Buddhas of the three times. ”The practice of the mantra helps achieve perfection in the six practices from wisdom to generosity. The path of these six perfections is the path walked by all the Buddhas. What could then be more meaningful than to say the six-syllable mantra and accomplish the six perfections?” – Dilgo Khyentse Rinpoche. Vajrasattva signifies “diamond being” or “vajra-being”. By practicing daily his Dharma, the follower can avoid all evil thoughts, eliminate vexations and have unlimited happiness and wisdom. Vajrasattva practice is also a tantric meditation done for the purification of negative karma. As a Mahayana practice, it is undertaken with a bodhicitta aim to dissolve all our bad karma in order to reach enlightenment as fast as possible in order to be best able to help all sentient beings. Vajrasattva long mantra translates as – ”Oṃ Vajrasattva! Preserve the bond! As Vajrasattva stand before me. Be firm for me. Be greatly pleased for me. Deeply nourish me. Love me passionately. Grant me siddhi in all things, And in all actions make my mind most excellent. Hum! Ha ha ha ha ho! Blessed One! Vajra of all the Tathagatas! Do not abandon me. Be the Vajra-bearer, Being of the Great Bond! Aḥ. Medicine Buddha is the highest possible model of a healer. Frequently referred to as the “Medicine Shiva”, he is described as a doctor who cures ailments using the medicine of his powerful teachings. The healing process is possible just by the invocation of His name or the thought of Him. Medicine Buddha was venerated as the dispenser of spiritual medicine that could cure psychological, spiritual, and physical disease. This Medicine Buddha mantra – ”Tayata Om Bhekandze Bhekandze Maha Bhekandze Randza Samungate Soha” is chanted for healing and success. Since we have many problems and want to succeed, we need to chant the mantra daily with sincere intentions. Additionally, the mantra can enhance medicines by reciting the mantra prior to taking them. Goddess Tara (whose name signifies “she who ferries across” or “star”) is a Bodhisattva of compassion who manifests in female form. In Tibetan tradition, She is known as “Dolma” or “She Who Saves.” In particular, Goddess Tara represents compassion in action, since She’s in the process of stepping from Her lotus throne in order to help all sentient beings. When we recite the Green Tara mantra, we are simply asking for Goddess Tara’s blessings and help with our lives and our problems. This entry was posted in Buddhist Mantras on November 1, 2016 by admin.